With temperatures in Chicago reaching the 30’s this week, we thought it would be great time to remind everyone about pet safety and the cold weather. Although our furry friends may appear they are ready to brave the elements with their thick layer, cats and dogs are also at risk for hypothermia and frost bite. “But dogs are the descendants of wolves, and wolves live outside”…Uh No, it doesn’t work that way. So how cold is too cold for my pet? 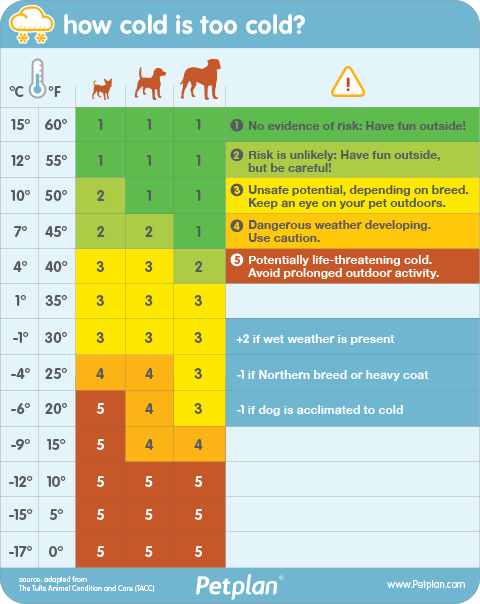 We’ve found a useful chart posted on the Pet Plan website which can be used as a good reference on whether or not your pet should be outside. Simply put, when in doubt, just stay in. Although snow and ice may seem like a great environment for your pet to romp around and play, the cold accompanied by icey conditions may be to hazardous and can lead to injury.